Collar and undercollar, if you want to get all technical about it. These pieces will be truly drafted, which is exciting! The first thing we need to know is how big to make our collar. 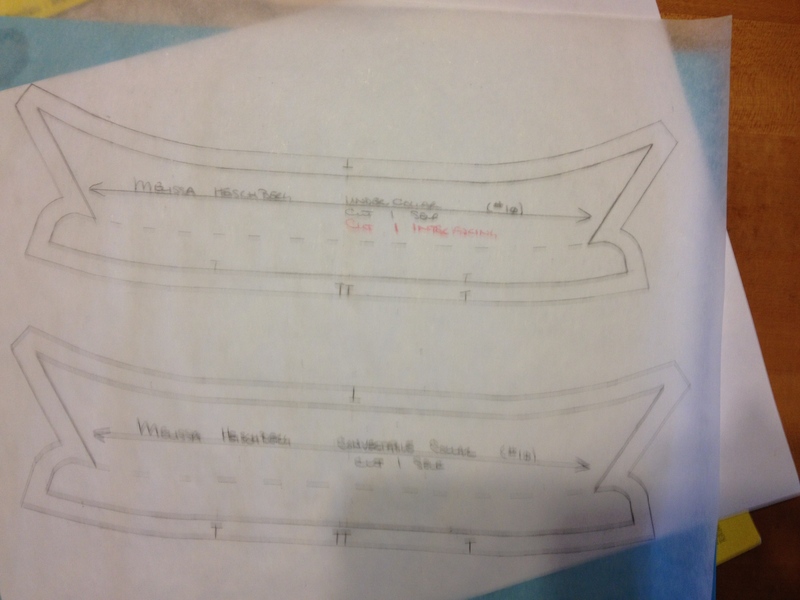 Measure around the front neckline – do not forget that this includes the front of the button placket! 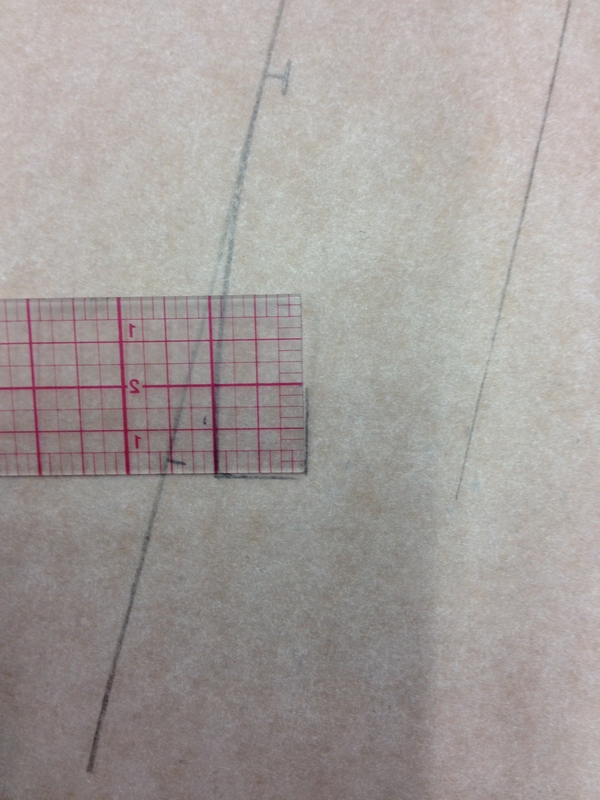 You will need to walk the ruler around the curve in little steps. Measure the back as well. 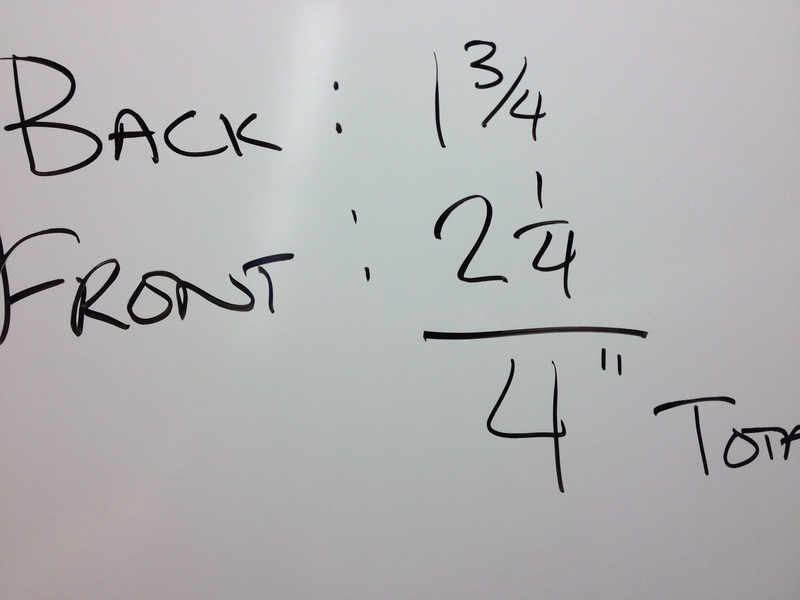 On our half scale, we had 1 3/4″ around the back neck and 2 1/4″ in the front neck (including placket), giving us a 4″ total. Start with two absolutely square lines. 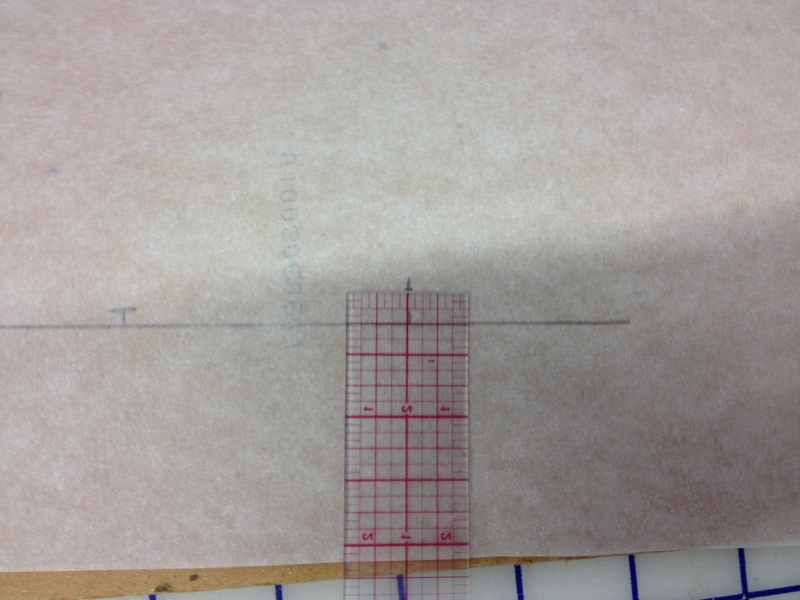 Remember: always use a thin line on the ruler to line up instead of a thick one. It’s more accurate. 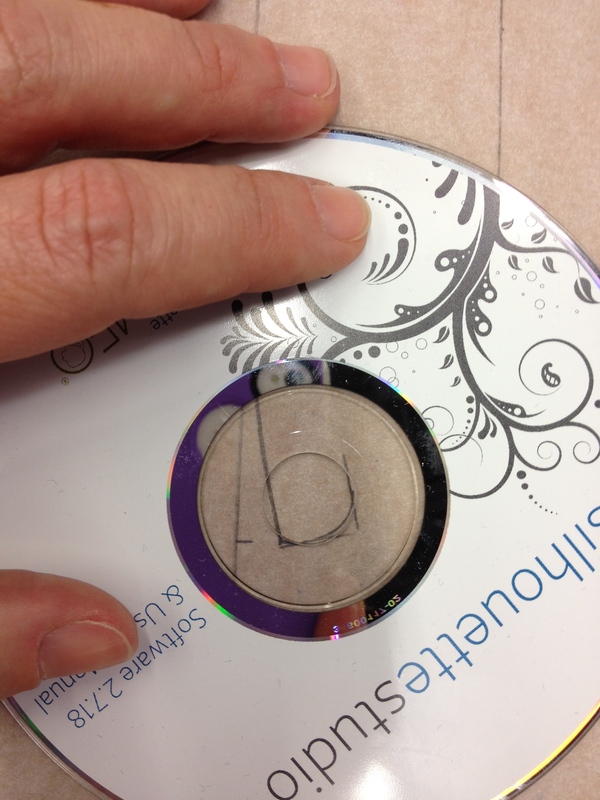 Label one of your lines as the center back of the collar (CB). On the other line, measure out 4″ (total neckline measurement), and mark a notch at 1 3/4″ (location of shoulder) from the back neck. 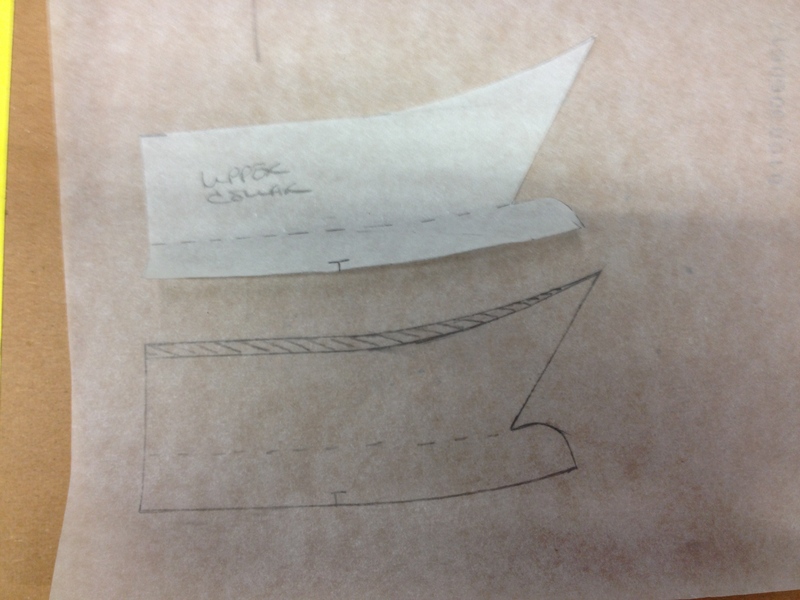 For our half-scale collar, we’re going to raise the front edge by 1/4″. 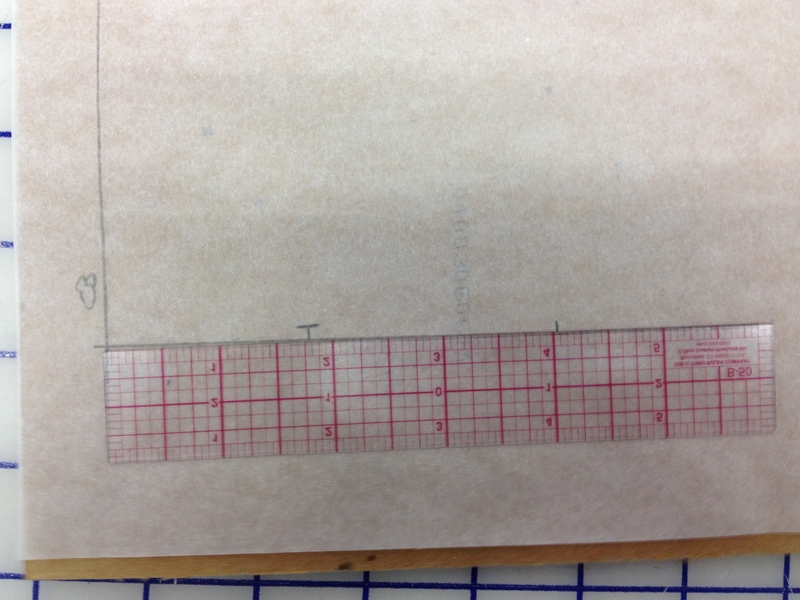 Mark a guide 1/4″ above the bottom line, directly over the 4″ mark. Starting at the shoulder notch, connect the bottom line to the new guide in a smooth curve. For a full sized human being, a collar like ours would stand about 1 1/2″ at the center back neck. This style of collar folds over itself, so full size is around a 3″ piece. 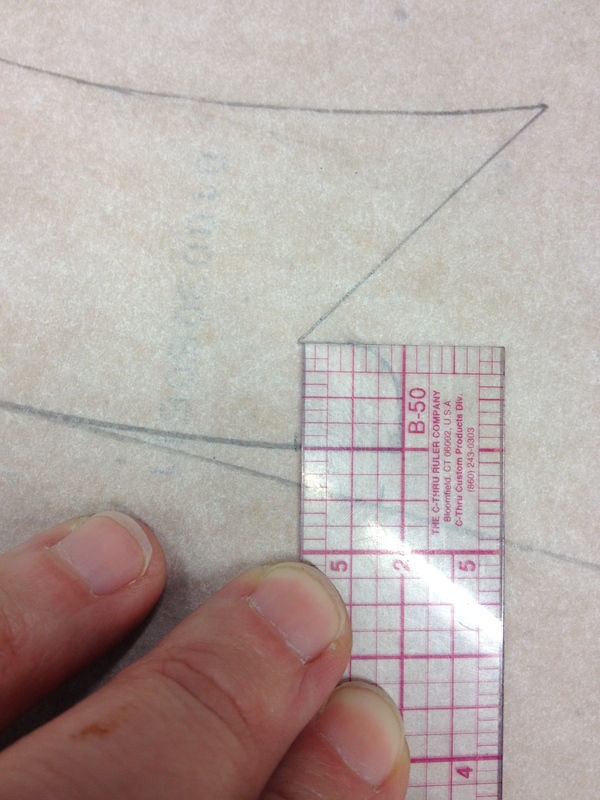 For our half scale, we’re going to mark out a 1 1/2″ tall piece, starting at the center back. 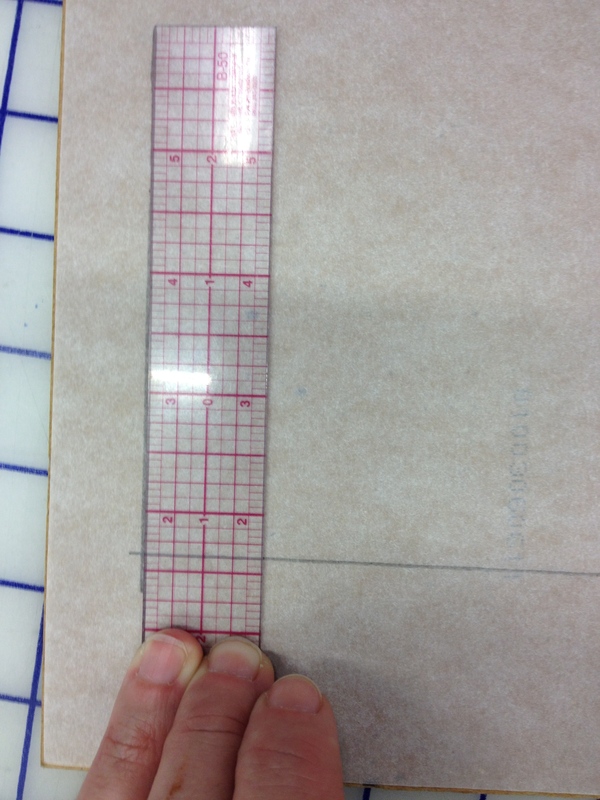 Square at least a 4″ guideline. 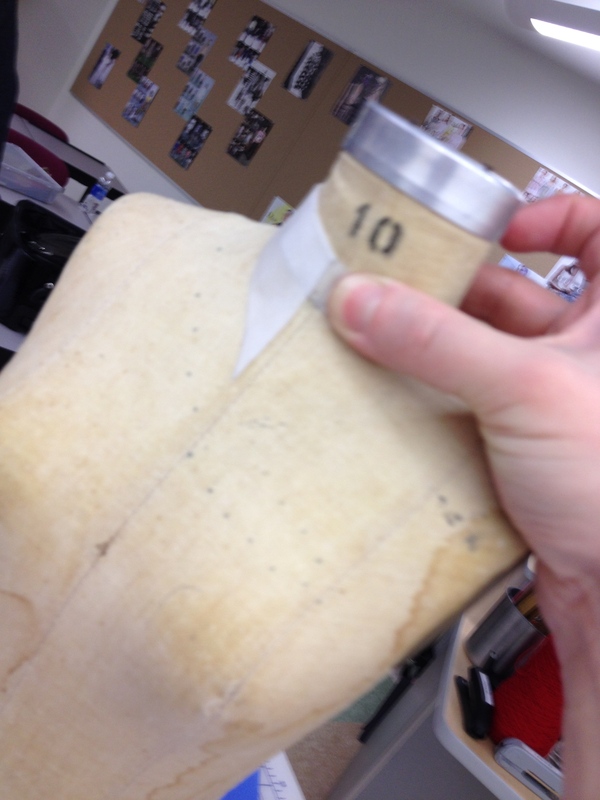 It’s common to put a little rounded corner on the collar button extension. We have a button extension, and a guideline for our collar. The nice thing with collars is that we can get a little festive in the front. 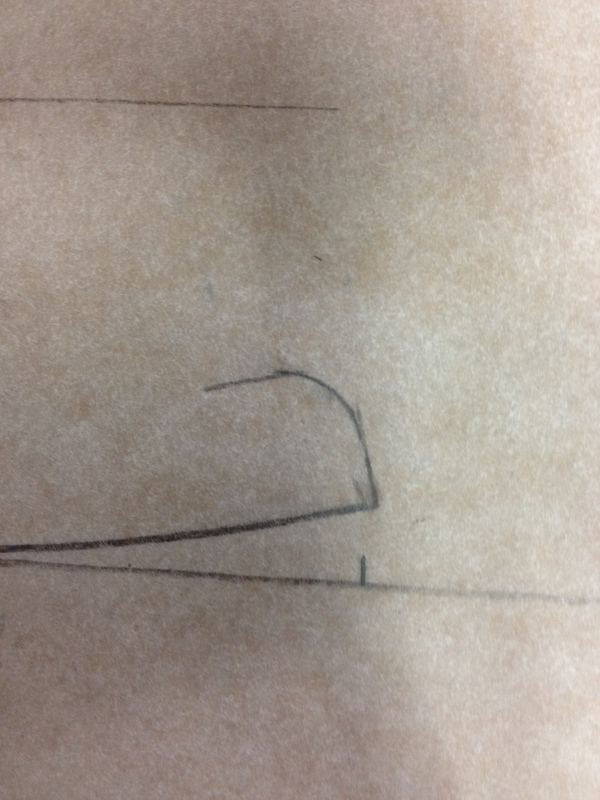 I’m starting an exaggerated curve at the shoulder point. At the very least, you should curve up 1/4″ so your collar doesn’t get narrower in front. Connect the end point of the collar with the inside of the button extension. Putting the collar on the stand like this lets us see exactly where the roll line (the fold) of the collar lies. Because this kind of collar has a built-in stand (the part closest to your neck that holds the collar up), the roll line should flow from 3/4″ at the center back (as we planned) to 1/2″ at the front (forced by the button stand. Sometimes you’ll want to force the roll a hair lower, to be sure that the join between the collar and the body of the garment is covered. 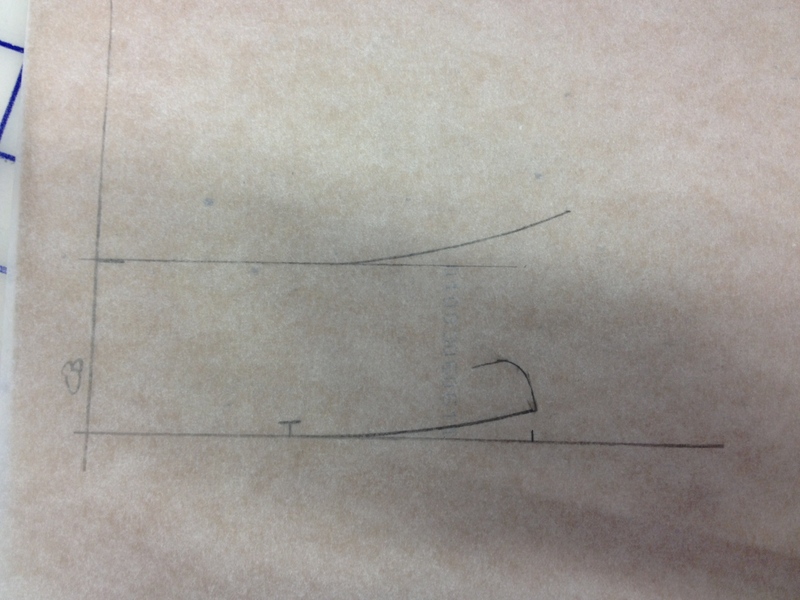 To make the under-collar, trace the upper coller (including notches). 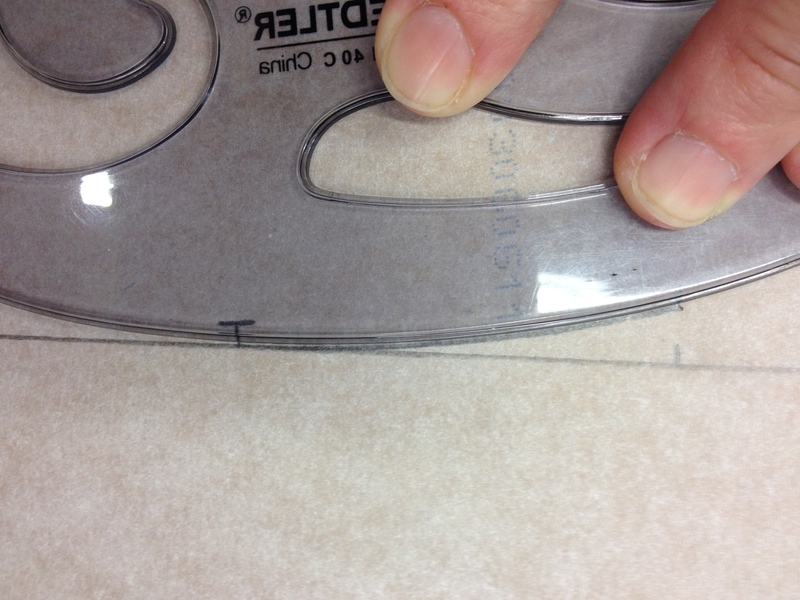 Remove 1/8″ from the collar edge. This amount fades to nothing at corners. 1/8″ is the amount we use in full scale. We’re using it here in half scale too because 1/16″ is just silly. Grain lines on collars can be straight, cross, or bias, but by the time you are calling something a pattern instead of a draft or a block, that decision should be made. 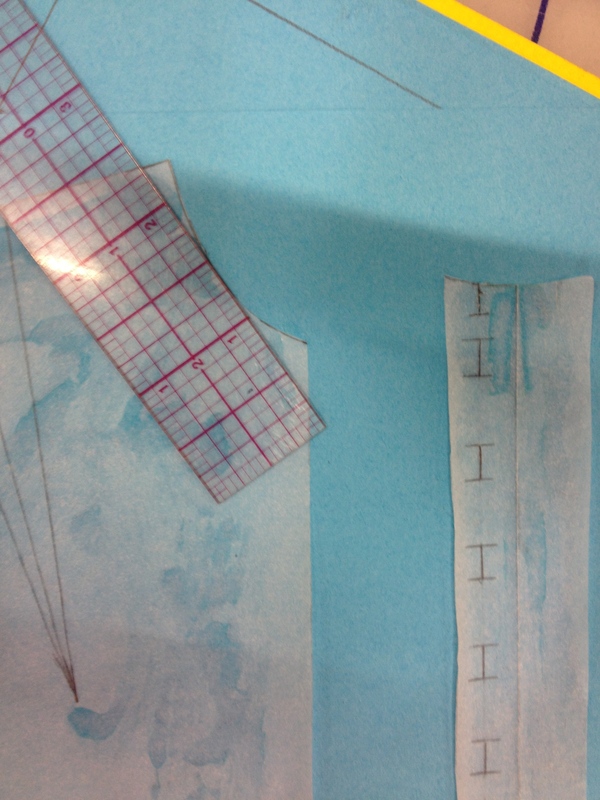 One grain line per pattern piece!